ICM is a model company based in the Ukraine. This kit was distributed by Italeri in Italy. This kit comes in a shrink-wrapped end opening type box. I am no fan of this type of box, because invariably PE frets, decal sheets or small parts find their way past the end flaps to become lost. 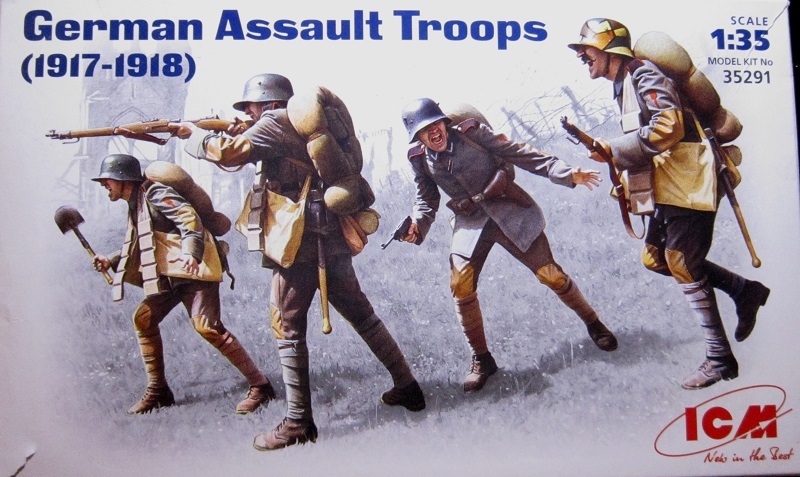 The box art shows 4 WWI German assault troops advancing down a grassy slope with barbed wire emplacements and a destroyed church in the background. The grass, barbed wire and church are all done pale and ghost-like. 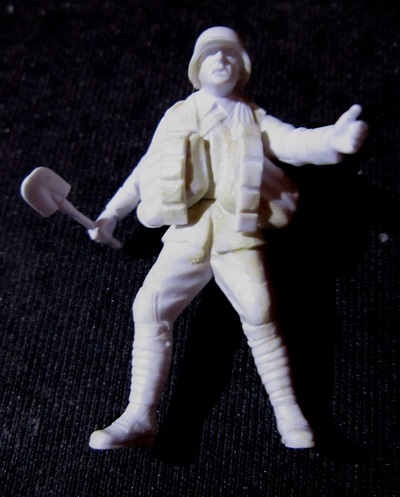 The leading soldier is yelling and holding a trenching shovel in his right hand. He is dressed in a pale green jacket, darker green trousers, pale green putties and black shoes. He wears a steel helmet that is black, an ammo bandoleer slung around his neck, a canvas bag on his hip, a bed roll on his back with a mess kit and a shovel in it’s pouch. 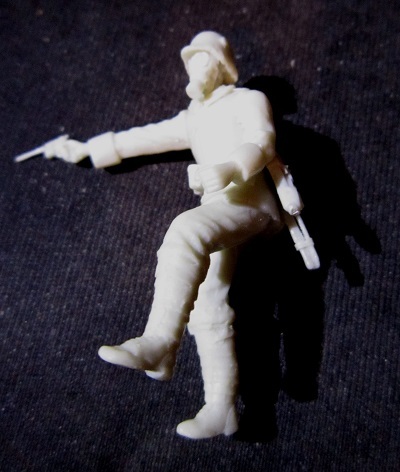 The next soldier has his rifle raised in firing position. He is dressed the same as the first soldier and has the same equipment on him. 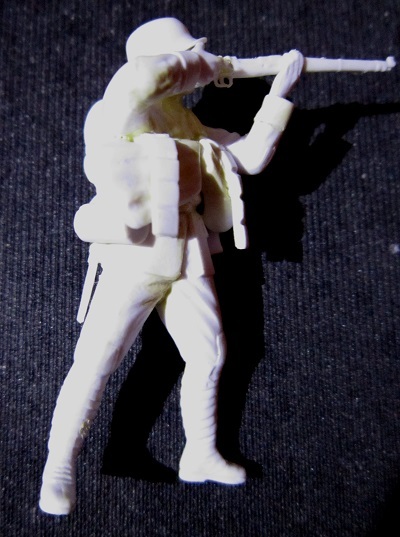 The third soldier has a lugar pistol in his hand and is waving the 4th soldier on. He is dressed the same as the other 3 soldiers, but has less equipment on him. I’m guessing he is a non-com or an officer. The fourth and last soldier is advancing with his rifle at port arms. He is dressed the same as the first two soldiers and equipped the same. One side panel says: This kit contains an unassembled model kit. 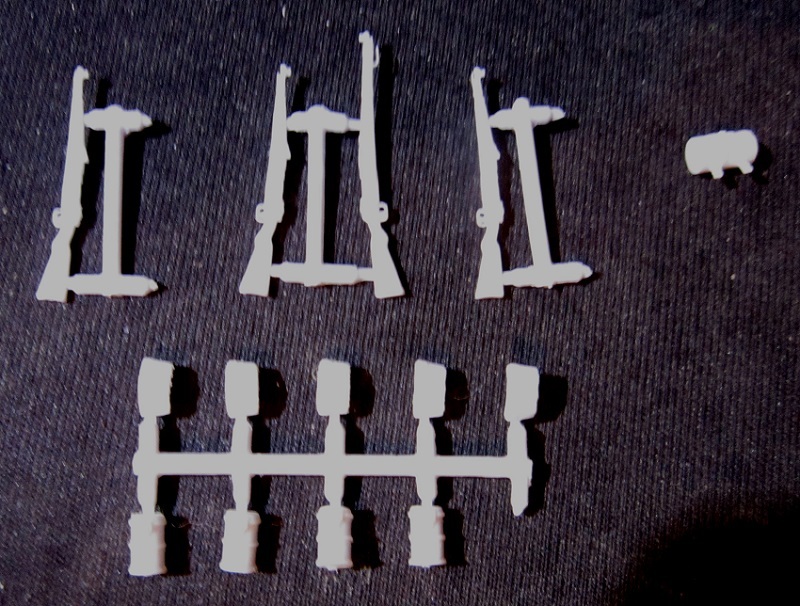 The kit includes 86 parts for assembly of 4 figures. Cement and paint needed to finish model as shown are not included. Instruction sheet with drawings included. Below this it says that the kit was made in the Ukraine by ICM Holding and gives their P.O. Box address there and telephone number and 2 different web addresses. It says here that he kit is suitable for modelers over 10 years of age, but not suitable for children under 3. It may contain small and sharp parts. Next it says that the kit is distributed by Italeri and gives their street address in Italy and their web address. The other side panel has 4 color box arts for other figure kits that ICM markets: French-Prussian War, French Line Infantry figures 1870-1871, kit no. 35061, Soviet Tank Crew, 1939-1942, kit no. 35181, Soviet-Afgan War, Soviet Motorized Infantry, 1979-1988, kit no. 35331 and U.S. Elite Forces in Iraq, kit no. 35201. The back of the box serves as the painting instructions in full color. A list of Model Master brand of hobby paints is provided along with color swatches of each color. The kit contains 2 chalk-white trees of parts, the instruction sheet and a small sheet printed on both sides with IMPORTANT INFORMATION CONCERNING THIS KIT, in 20 languages including English. The instructions consist of a single 8 ½” x 11” sheet, printed on both sides and folded twice to fit the box. The face side us the assembly and painting instructions. There are optional rifles to choose from….a long one and a shorter one. 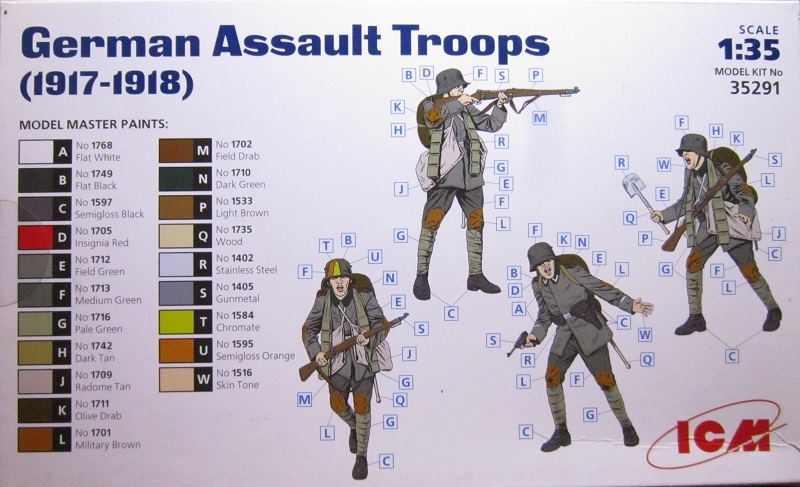 In these illustrations the soldier advancing with his rifle at port arms has his steel helmet as painted with black, yellow, medium green and semigloss orange vertical bands. The other side of the sheet has the parts trees illustrations above the Model Master paint listings and some CAUTIONS in Ukrainian and English. ICM Holdings P.O. address in the Ukraine and their e-mail address are given at the bottom of the page. Years ago, there was a company called Japanese Armor King on the web. This guy has since gone out of business. He sold a lot of resin WWII Japanese subjects and a line of WWI German soldiers. He once sent me a sample of one of these Germans. The fellow is advancing with a lugar in his right hand. 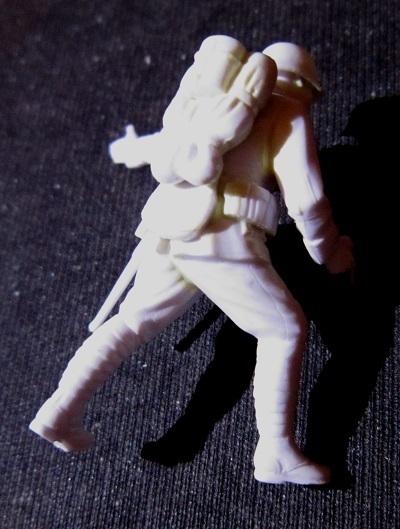 He wears the same uniform and helmet as the Emhar figures. ammo pouches on his belt along with a shovel in a pouch and a canteen. He has a gas mask on his face. 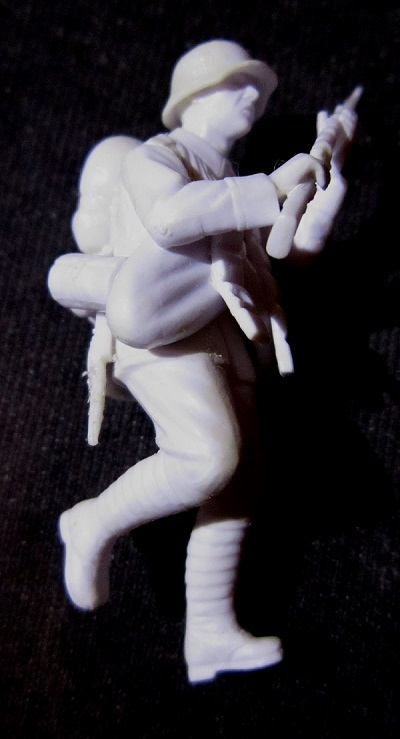 He is molded in light color resin. All these figures will eventually go onto a diorama with my Tauro brand WWI German A7V “Totenkopf” tank in the middle of no-man’s land. Japanese Armor King sent me their sample just in a zip-locked cello bag with the instruction sheet. 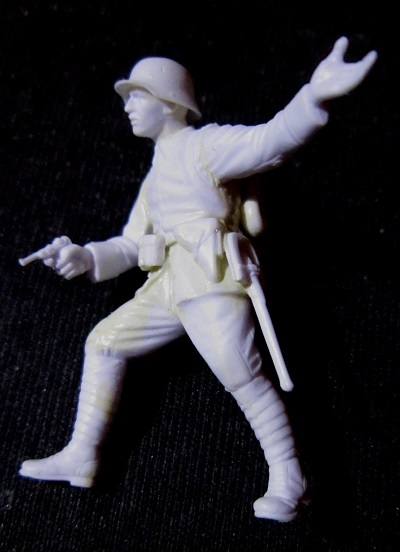 The named this guy “WWI German Strosstruppen 1917-1918, The Original Stormtroopers”. The small instruction sheet is printed on both sides. The face side has an exploded drawing of the figure. 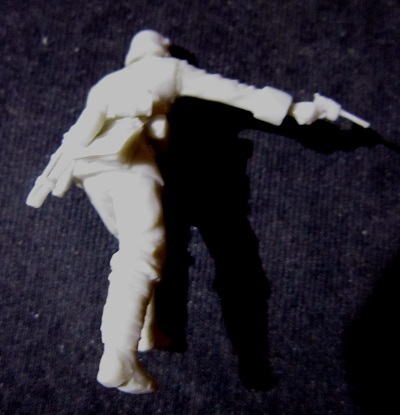 It is up to the modeler to make gun slings where appropriate (no rifle with this guy). 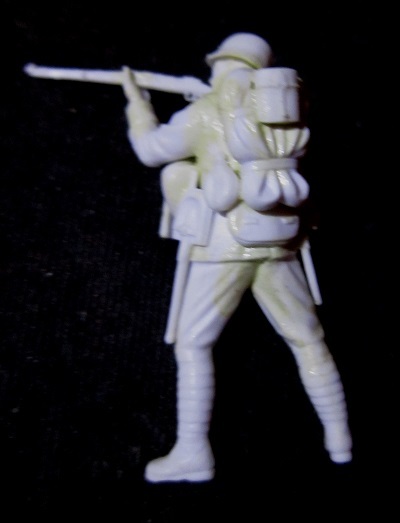 I recommend these WWI figures as they are probably the only ones ever done of Germans in that war in styrene. 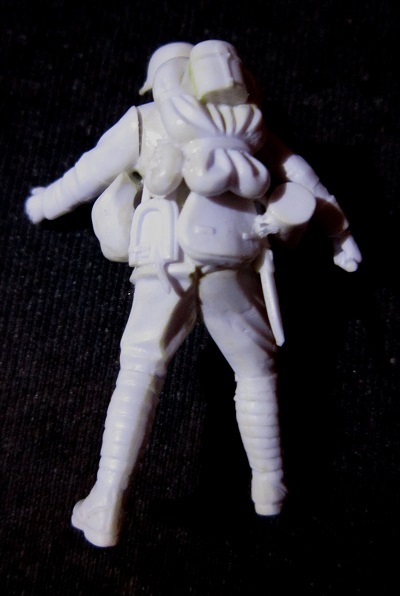 I do have a set of WWI German soldiers by Emhar brand, but they are hard rubberized plastic and molded all in one piece each with no separate parts and a ground base molded to their feet. I have found that this type of rubberized plastic will repel paint and is like sanding jello to remove seams. I did not know what they were until I opened the box and was sadly surprised….groan. This kit was courtesy of my wallet years ago. It can be found on line at a on web hobby shop in the U.K.